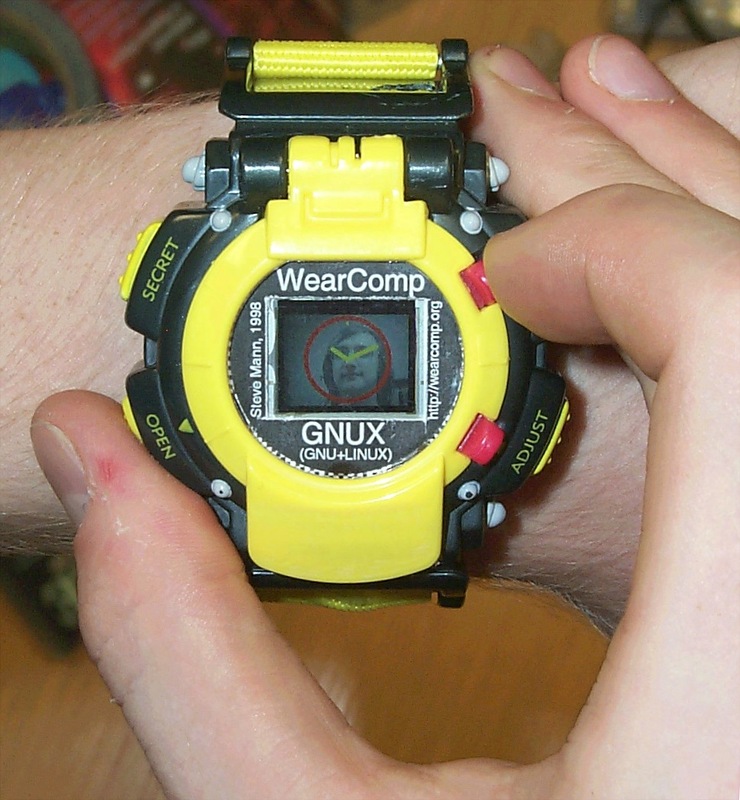 A wristwatch videoconferencing computer running the videoconferencing application underneath a transparent oclock, running XF86 under the GNUX (GNU+Linux) operating system. A SECRET function, when selected, conceals the videoconferencing window by turning off the transparency of the oclock, so that the watch then looks like an ordinary watch (just showing the clock filling the entire 640x480 pixel screen). The OPEN function cancels the SECRET function and opens the videoconferencing session up again. Bonus points for anyone who can guess where inside the watch the broadcast quality full colour video camera is concealed. The current embodiment requires the support of a separate device that is ordinarily concealed underneath clothing (that device processes the images and transmits live video to the Internet at about 7 frames per second in full 24 bit colour). Presently we are working on building an embodiment of this invention in which all of the processing and the communications device fit inside the wristwatch so that a separate device doesn't need to be worn elsewhere on the body for the wristwatch videoconferencing system to work. The computer programs, such as the VideoOrbits electronic newsgathering programs (not to aggrandize programs with words like ``software'') developed as part of this research are distributed freely under GNU GPL.